Aikatsu! – 53 | Mezashite! The absolute taste thing reminded me of Kitchen Princess (also known as Kitchen no Ohime-sama). Wait… how does one usually romanize お姫様? Ohime-sama looks wrong. O-hime-sama looks stupid. Ohimesama looks awkward. Whatever. Kitchen Princess. Best shoujo manga I’ve ever read. Oh, I just realized something. Is it just me or the video’s a bit sucked on the seiza fiber scene? This doesn’t really matter, but the OP chapter starts a little late. 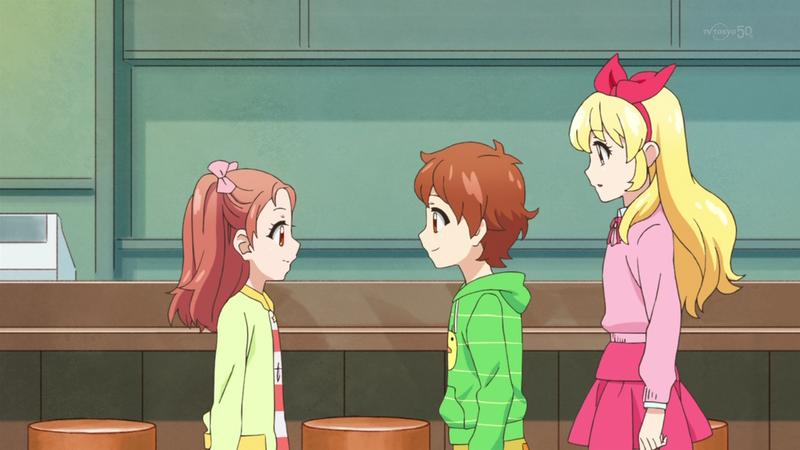 Among the many other nice touches and details in this series, check out Ichigo and Raichi’s relative heights in this picture compared to the start of the series http://s14.postimg.org/nxqjnuiy9/hoshimiya.png . Despite the jokes about it only being a week since Ichigo left, they’re clearly paying attention to the time skip.